Home » Hollywood Democratic Committee » From "Win the War" to "Win the Peace"
Atomic energy security provided the third pillar of the HDC’s tripartite strategy to win the peace. Rather than one or two star-heavy programs like those performed in support of UN and Bretton-Woods agreements, HICCASP’s strategy on atomic power issues employed several smaller meetings featuring prominent scientists and intellectuals. One reason for the change might be the obvious affinity between scientists and nuclear issues. However, it is also possible that the organization’s expanding affiliations with other professional groups after 1945 diluted the role of Hollywood talent within the organization as more artists and academics joined. The first major atomic issue broached by HICCASP concerned control over atomic research. Many government officials, including President Truman, supported the House’s May-Johnson Bill, which proposed continuing military control over atomic policy. Protests by prominent scientists and others led Senator Brien McMahon to introduce a substitute bill that set up a primarily civilian oversight board. Fearing military control would strain international relations and decrease international scientific collaboration, HICCASP fought for the defeat of the May-Johnson bill and the subsequent passage of the McMahon bill. 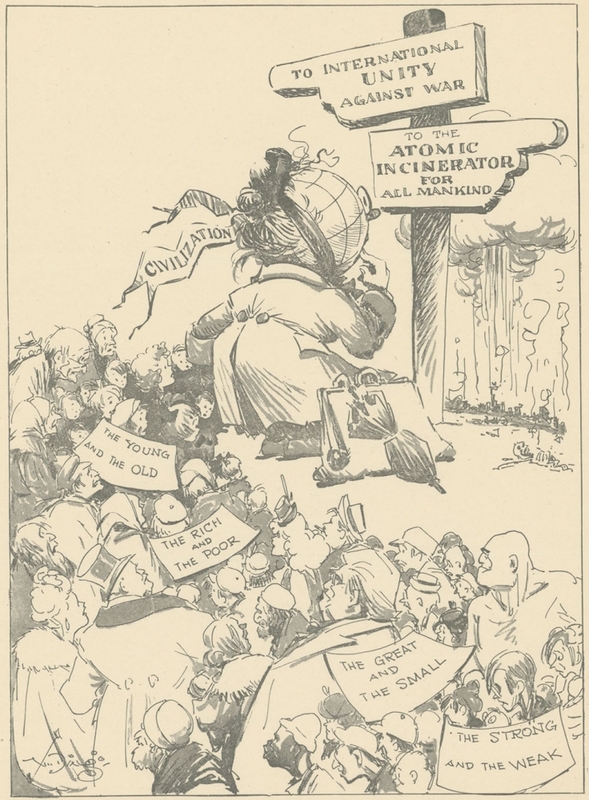 One of the first efforts in these campaigns was the “Atomic Power and Foreign Policy Meeting.” Featuring speeches by California Representative Helen Gahagan Douglas, State Assemblyman Albert Dekker, Marine Corps Colonel Evans F. Carlson, and Dr. Harlow Shapley, the gathering condemned the nationalist, militaristic provisions of the May-Johnson Bill. Also present was Vincent Price who read “Set Your Clock at U-235,” an antinuclear poem by HICCASP member Norman Corwin that the organization publicized widely beyond the meeting. 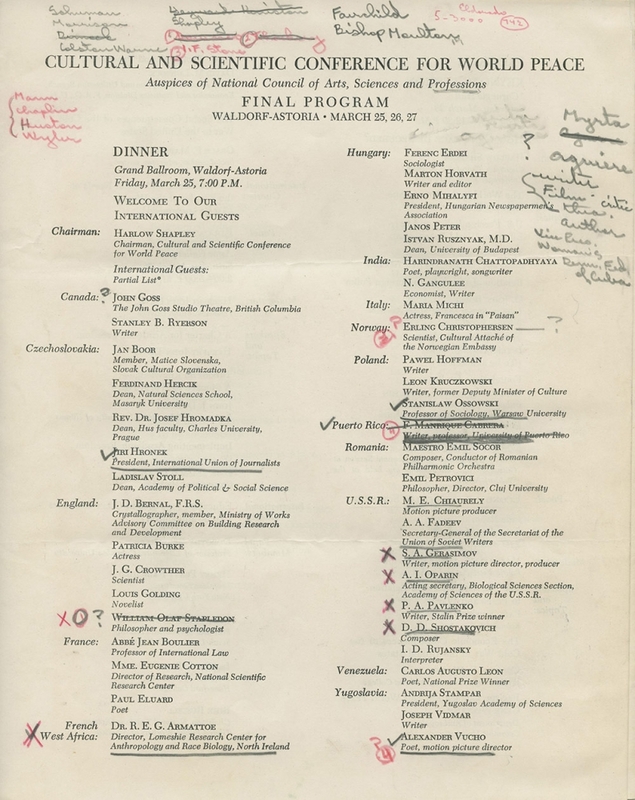 In addition to a script of the program, records of the event include an internal write-up of the success of the show, expense reports, and suggestions for future meetings, all of which provide unusual insight into the HICCASP’s strategies and operations as a functioning civic and labor organization. At least one other HICCASP meeting made use of similar speakers and structure, and individual members of HICCASP attended affinity programs held by other organizations to publicize their pro-peace stance. 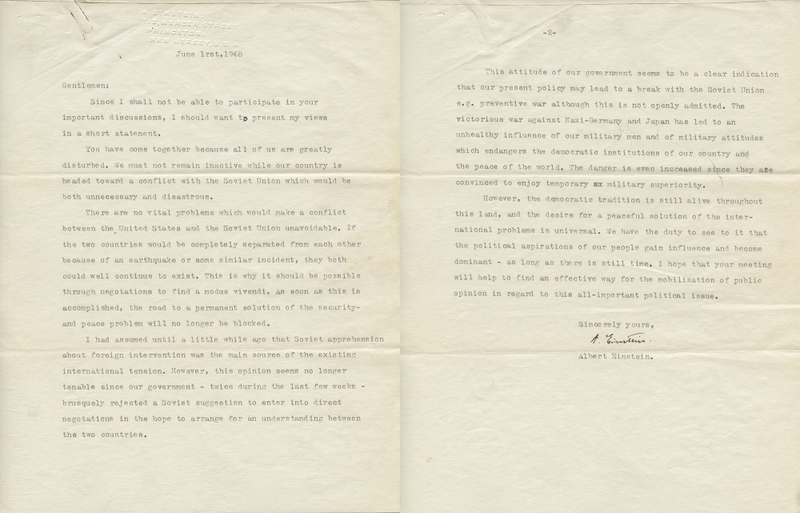 The McMahon bill was signed by President Truman on August 1, 1946. HICCASP, and later ASP-PCA, devoted much of its energy in 1947 to HUAC’s attacks on Hollywood. However, when the committee shifted its attention to investigating scientists amid the increasing tensions of the Cold War, ASP-PCA, and later NCASP, lead and participated in several science-centered peace conferences in the latter part of the decade. 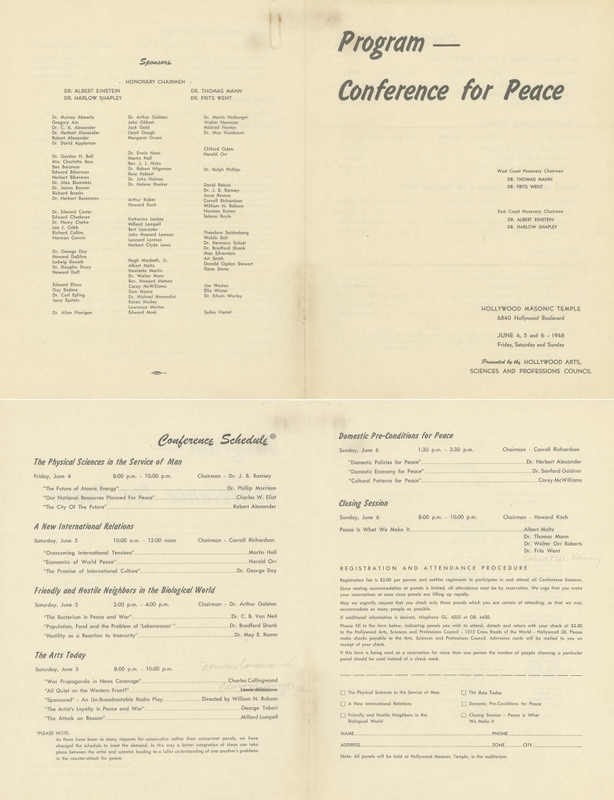 In 1948, H-ASP—the Hollywood chapter of NCASP—sponsored the “Conference for Peace,” which featured panels on issues such as “The Physical Sciences in the Service of Man,” “The Arts Today,” and “Friendly and Hostile Neighbors in the Biological World.” A remarkable record of the conference exists which contains the text of almost two-thirds of its presentations and a note from Albert Einstein, the East Coast honorary chairmen, to be read in his absence. A more fragmentary record remains for “Pattern for Survival,” the New York conference called by Einstein, Harlow Shapley, and the national leadership of NCASP held the same weekend. One of the last major peace events for which NCASP maintains records is the “Cultural and Scientific Conference for World Peace.” Held in New York at the Waldorf-Astoria March 25-27, 1949 at the height of the red scare, the meeting became a flashpoint for anticommunist sentiment due to the international scope of its delegation, which included several speakers from the Soviet Union. Maneuvering by the State Department—which already included NCASP on its list of subversive organizations—seriously tarnished the reputation of the conference before it began. Granting visas to communist speakers while denying visas to delegates from allied capitalist countries, including Britain and France, the State Department gave the conference the appearance of a pro-communist rally on American soil. Although NCASP petitioned the State Department asking it to reverse its decision, the conference was widely believed to be a front for communist organizing, and it occurred under the shadow of anti-communist protests. As the backlash against the “Cultural and Scientific Conference for World Peace” attests, progressive public organizing became more dangerous as the Cold War wore on and the gulf between H-ASP and the Truman administration widened. Far fewer Hollywood figures who signed on to HDC in the early forties could be found actively and publicly demonstrating for the organization’s later goals. Not only did HUAC pose a very real threat to many livelihoods, the effect of public activism on an actor or actress’s public star image had changed drastically in a few short years. Throughout these changes, however, the materials on the organization’s peace activities presents a unique history of political collaboration between the arts and sciences, two fields that would be radically depoliticized in ensuing years. Boyer, Paul. By the Bomb's Early Light: American Thought and Culture at the Dawn of the Atomic Age. Chapel Hill: University of North Carolina Press, 1994. Gosling, F. G., The Manhattan Project: Making the Atomic Bomb. Darby, PA: Diane Publishing, 1999. Wang, Jessica. American Science in an Age of Anxiety: Scientists, Anticommunism, and the Cold War. Chapel Hill: University of North Carolina Press, 1998.